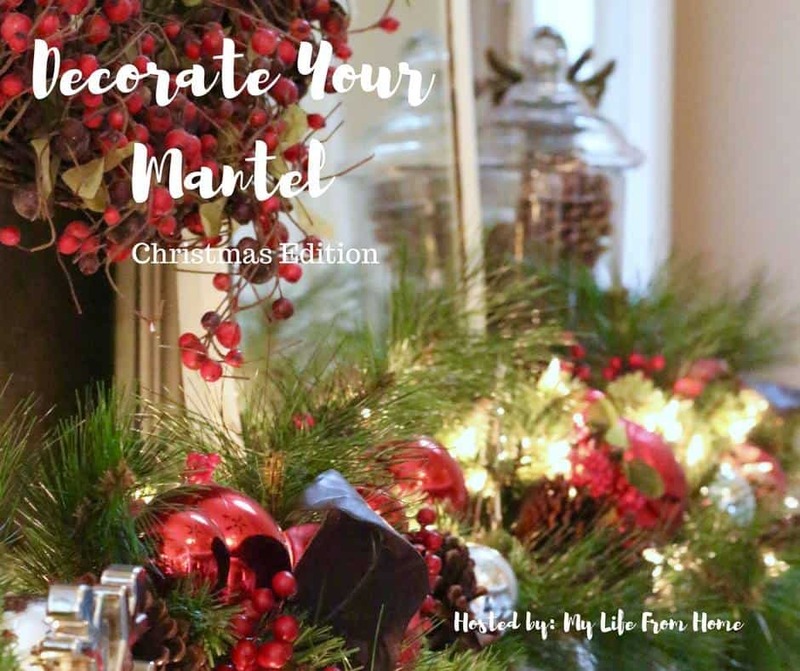 I’m so happy to be back in the swing of things with a festive and classic Christmas mantel that I’m sharing today as part of the Decorate Your Mantel blog hop! 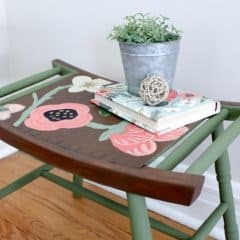 My friend Amy at My Life From Home has been hosting this hop for the last year or so, and I’ve loved participating. 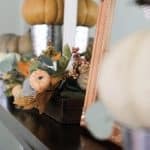 I missed the fall edition due to lack of preparedness, but now I’m ready to share my Christmas mantel along with lots of other bloggers (links to their posts are at the bottom of this post)! So come on in and let me show you around! 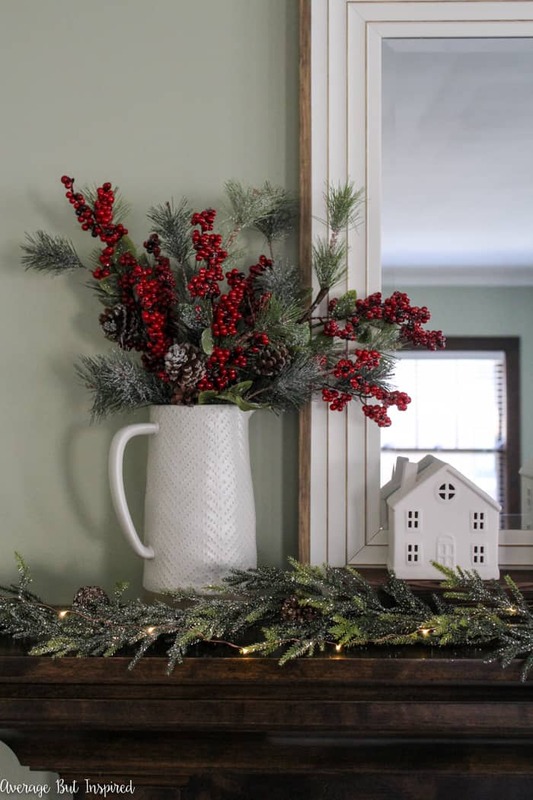 I’ve always gravitated toward a more classic Christmas style, filled with reds and greens and your typical Christmas icons, like Santas and Christmas trees. What can I say? I’m old school. 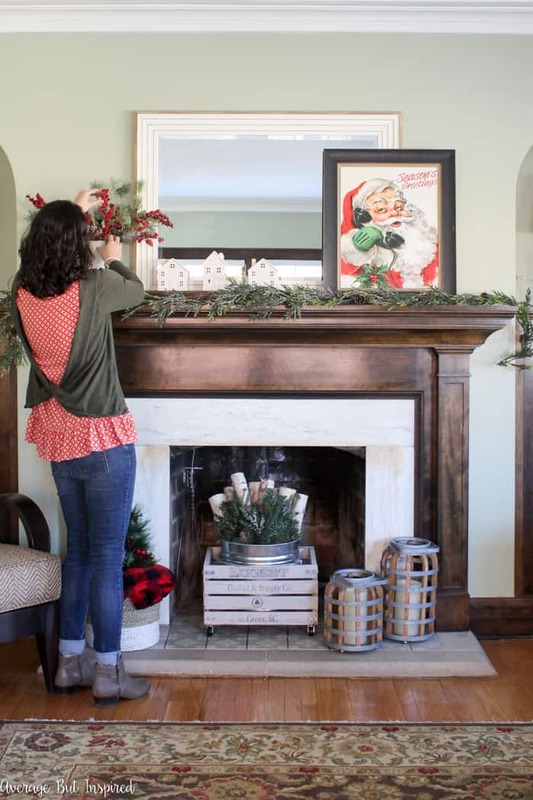 My mantels in the past have reflected that (like this one, and this one), but I think that this year’s Christmas mantel is my favorite because it’s classic, simple, and fun all at the same time! 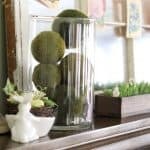 My new favorite textured stoneware pitcher is pulling decor duty for this mantel, serving as a nice vase for my faux greenery. 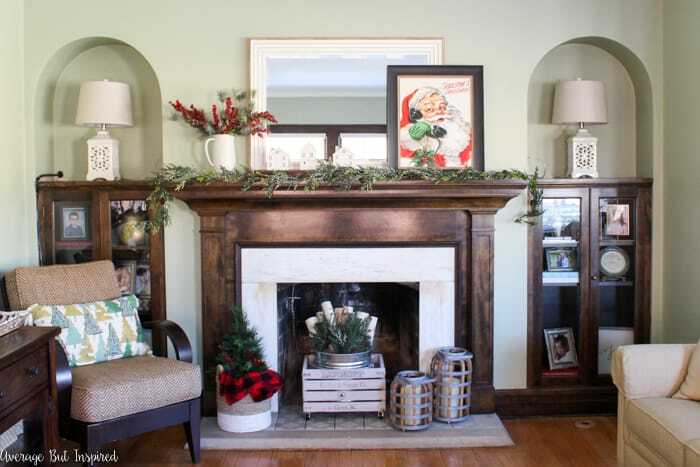 I like how the iced greenery coordinates with the glittery garland on the mantel! And I’m so happy that I found a spot for my cute porcelain snow houses that I got at Target in Bullseye’s Playground (they should really rename that section “Breighanne’s Playground!”). Target doesn’t have those little houses anymore, but you can find some adorable ones here! I propped those little houses up on the bottom side of my wood planter box to give them some height over the garland. They’re happy to be nestled in close to my cute Santa art print. 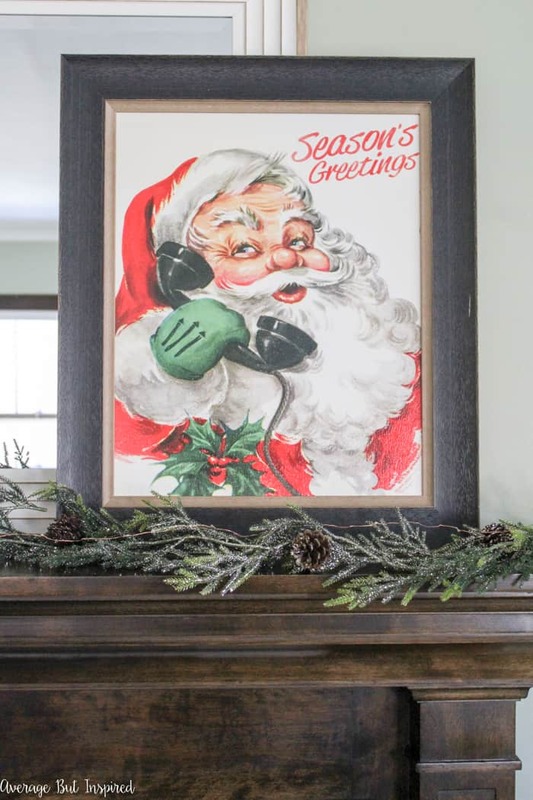 This art print might not be everyone’s favorite (like my husband), but I couldn’t resist this vintage-looking Santa! I moved the stockings to the bookcases this year (hey – all the song says is that they need to be hung “by the chimney with care.” I think this qualifies), and still need to add family photos to the photo stocking holders! Ooops. So there you have it – my classic Christmas mantel for 2017. 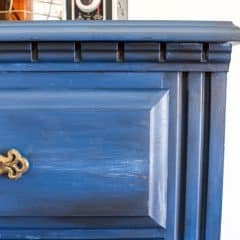 I hope you enjoyed seeing how I made the classic look work for me! 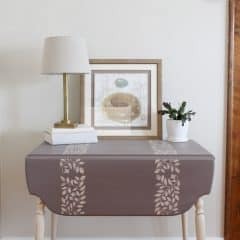 If you see anything you need to have for your own decor, you can shop the post right here by clicking the photos below! Now, please make sure to go visit my friends’ posts so you can see their festive decor, too! 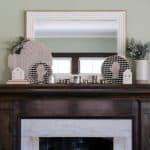 Bre – Your mantel is fabulous! 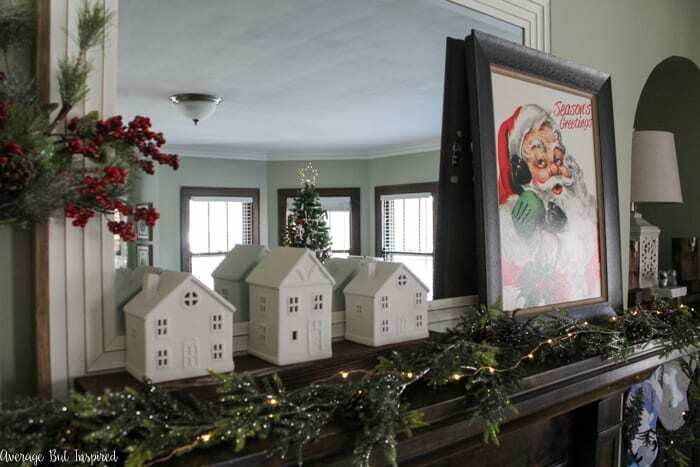 We collect vintage Santa’s so we love the one that you are displaying – definitely a classic. 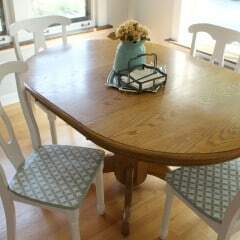 And those darn houses from Target…we are both kicking ourselves that we didn’t buy more. They look perfect as a village on the mantel. You always crack me up – that darn Dollar Spot section is ADDICTING. Love your vintage Santa and those little houses! Merry Christmas, Friend! 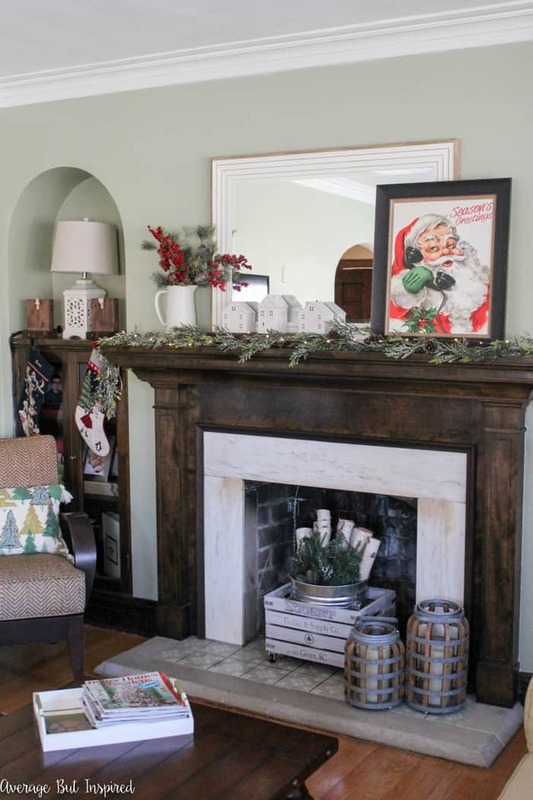 Bre, I love this year’s mantle! 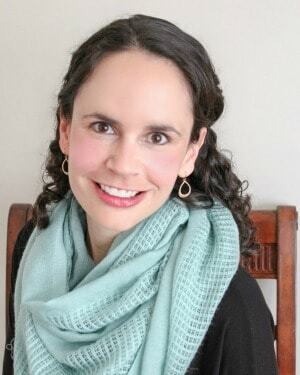 That Santa print is adorable – it’s okay, my husband challenges my style, too, and doesn’t win! I also love the Target houses – I didn’t see those! I wish you and your family a very Merry Christmas! Love the Santa! Oh my gosh it all looks so fabulous! Thank you so much for participating! Tell your husband he’s crazy because that Santa art is fantastic! 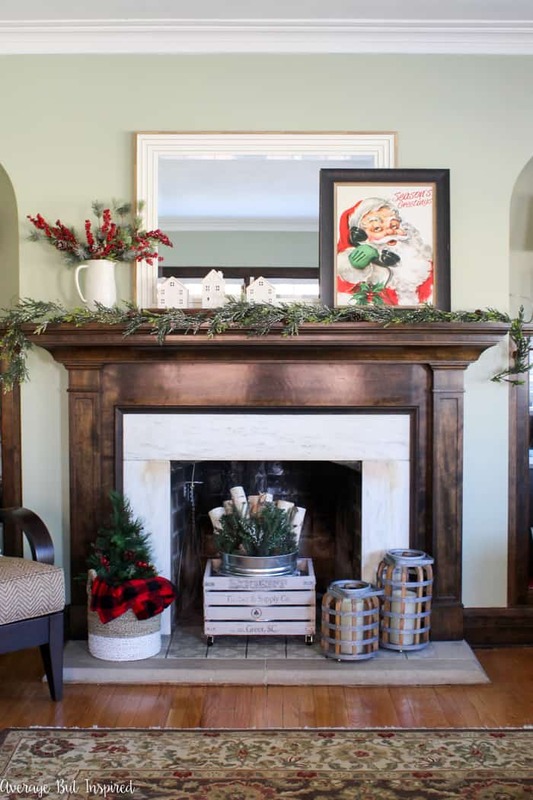 Love your classic mantel.